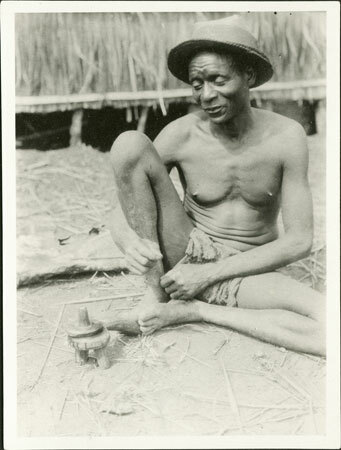 A man (identified as Windis or Zori, a subject of Gami, a commoner Governor) sitting on the ground within a homestead, his foot resting on the tail of an iwa (rubbing-board) oracle. Morton, Chris. "Consulting the Zande iwa oracle" Southern Sudan Project (in development). 03 Jan. 2006. Pitt Rivers Museum. <http://southernsudan.prm.ox.ac.uk/details/1998.341.223.2/>.